The variety of savory flavors in Thanksgiving feasts makes choosing wines to serve tricky. We suggest pouring several different wines to bring out the best in each delicious course. The California Wine Club makes it easy with a collection of wines selected to pair with the flavors of the season. Shop Now for Perfect Pours for Thanksgiving. Back in the old days, savvy horse traders supposedly could gauge an animal's true age by looking at its teeth. Did you know that we can do something like that with wine, too? Well, sometimes we can, anyway. Let's be frank: This is mostly a wine-geek trick. But for those of us who love wine and understand that there's enjoyment in the details that goes beyond simple quaffing, it's just fun to play with our wine - and maybe learn something that adds intellectual depth to our enjoyment - before it goes down the hatch. So, take your glass. Even before you swirl and sniff it, hold it up to the light and take a close look. I like doing this, anyway, because it's a good way to pause, relax, and get ourselves centered before we move on to the more serious business of sniffing, tasting, and thoughtfully contemplating why this glass is not quite the same as any other glass we've ever had before. Look at the color: Is the wine clear or slightly hazy? Clear is pretty, but some fine wines are deliberately left un-filtered. Is the wine transparent, murky, opaque? Again, don't draw immediate conclusions from this. A Pinot Noir from Burgundy will often be surprisingly light in color, hardly more intense than a dark rosé, yet rank among the world's greatest wines. A California Petite Sirah, in contrast, may be dark as ink and impossible to see through. Both wines are doing what they are supposed to do. Pour me a inky, dark Pinot, though, and I'll be suspicious that it's a New World points-grabber made in a Syrah-like, high-alcohol style that I'm probably not going to like. Red wines, too, once you've accounted for varietal difference in hue, may hint at their age and condition through their color, too. The chemical components called anthocyanins that give red wine its color may mask the obvious browning that shows up in whites, but look closely at the hue: A bluish-red, purple color hints that the wine is young and immature. Now glance at the edge of the wine, where liquid meets glass, and a clear, transparent rim will confirm our speculation that the wine is still immature. As it ages, that bluish tone may shift down the spectrum from purple toward red or reddish-orange; again, check the rim for a garnet/ruby color that signals the prime of life, moving toward bronze or brown as the wine gets old. 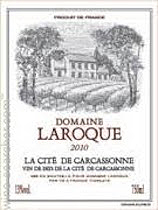 Today's featured wine, an affordable all-cabernet delight from Domaine Laroque in Cité de Carcassonne, the Languedoc wine region surrounding the beautiful, historic city of Carcassone, offered a textbook example of this: Garnet-purple, it was clearly on the blue side, and its edge was as transparent and clear as water. Sure enough, the wine, a new release only a year past last autumn's vintage, was delicious already, but still focused on fruit and showing soft, astringent tannins. You'll find my tasting report below. Next time you have wine in your glass, give it a try! Spend a little time eyeballing what's in the glass, and let me know if this step toward slowing down and smelling the roses, er, the wine, doesn't enhance your experience. For more information about the Carcassonne region, check this link to Wine-Searcher.com, where you'll also find links to 65 wines of the region from retail wine shops who offer them online. Now! You can join our forum from Facebook! Speaking of the WineLovers Discussion Group, great news! If you're a Facebook user, you can now join our forum with one click! All you need to do is visit the forum and click the "Social Login" link at upper right. The system will check your Facebook registration and instantly activate your forum membership with your Facebook user name. Please be assured that our system only checks your user name and Facebook email. We don't ask for any other information about you, your profile or your friends, or any other privacy invasion. There are thousands of small family wineries handcrafting extraordinary wine in quantities too limited to be found in local stores or shops. In 1990 wine club founders Bruce and Pam Boring discovered that these winemaking families were the most passionate in the wine world and that their wines were the hidden gems of wine country! Together Bruce and Pam embarked on a journey to help these artisan wineries introduce their exquisite wines to the world. Learn more! FOOD MATCH: A red-meat companion by nature, it would go well with steaks, roasts or even burgers; it was fine, too, with an old-fashioned bowl of beef stew. WHEN TO DRINK: It's certainly enjoyable now, but its clear edge and bluish-red color show its youth and suggest that a few years at cool cellar temperature might yield an even more complex and interesting wine. VALUE: My local $11 retail price is right on the $11 U.S. median reported at Wine-Searcher.com. At this price it's an impressive bargain; if you're convenient to one of the shops offering it for less than $10, consider renting a truck. There's abundant information about this wine and vintage on this detailed English-language PDF fact sheet from the producer. Locate vendors and compare prices for Domaine Laroque Cité de Carcassonne on Wine-Searcher.com. We hope you'll "Like" us on Facebook! If you use Facebook, we'd be delighted to have you "Like" our WineLovers Facebook Page. This way you can get Facebook notifications when there's a new The 30 Second Wine Advisor issue or a topic of particular interest on the WineLovers Discussion Group (WLDG). If you're a Facebook user, you can also now join our forum with a single click! All you need to do is visit the forum and click the "Social Login" link at upper right.